Today is my first day back in my home kitchen! It has been four months since I’ve last baked at home. For the past 16 weeks I was in Chicago completing the L’Art du Gâteau program at The French Pastry School. And prior to that, I spent eight months in Napa Valley studying Baking and Pastry Arts at The Culinary Institute of America at Greystone in St. Helena. While it feels great to use my own equipment and have the kitchen all to myself, I miss the hustle and bustle of the commercial kitchen. Upon arriving back home, I perused through numerous websites making purchases to restock my pantry with baking goods and new tools. My order from King Arthur Flour arrived yesterday afternoon along with a recipe for banana chocolate chip muffins. It just so happens I have a bunch of overripe bananas lying around. So I woke up this morning and made a batch for breakfast. I added some Reese’s peanut butter chips because I can’t resist peanut butter and bananas, and I washed it down with ice cold milk. Preheat oven to 350 degres F. Line muffin tin with cupcake liners. Set aside. In the bowl of a stand mixer, cream together butter and sugar until smooth. Add in mashed bananas, egg, vanilla, and milk. Mix until combined. In another bowl, whisk together baking powder, baking soda, and flour. Add to mixing bowl. Mix on medium speed until there are no longer any dry streaks of flour. Scrape down bowl as needed to ensure thorough mixing. Fold in chocolate chips, walnuts, and peanut butter chips until distributed. Divide batter among prepared muffin tin. Bake for 20-23 minutes, until a toothpick inserted in the center of the muffin comes out clean. 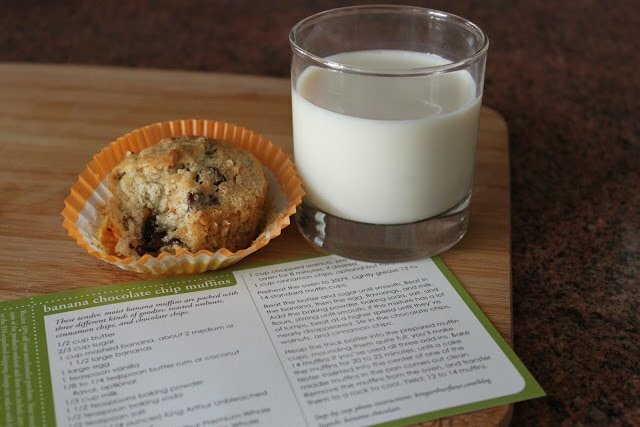 Allow muffins to cool in pan for 3-5 minutes before unmolding. Allow to cool on wire rack. Simple but it looks very healthy. I like it. Thanks for sharing. Look very good, but I can’t find the recipe. Where did it go?